My meal at the original CUT in Beverly Hills, specifically the genuine Wagyu, really redefined my preconceived notions of steak. 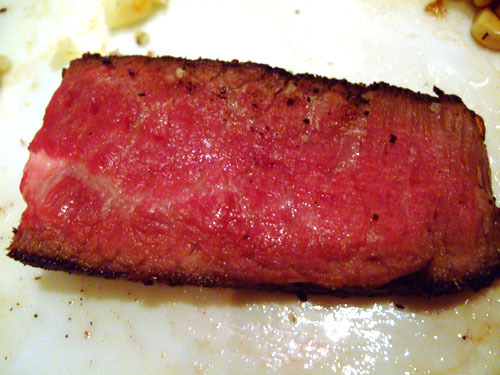 The Japanese beef literally was unlike anything I'd ever experienced up until that point, and to this day, is what I compare all subsequent steaks to. 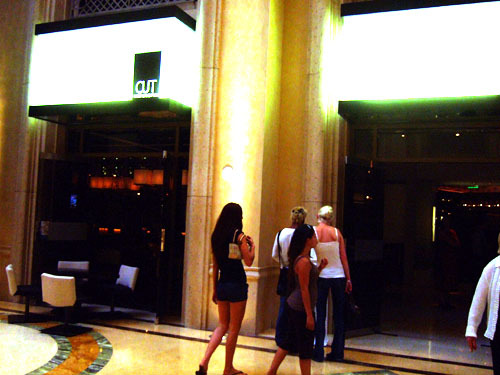 So when I happened to find myself in Las Vegas looking for a good steak, the new location of CUT was a natural choice. 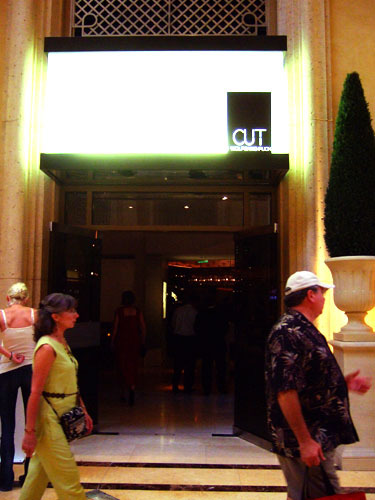 CUT is located in the shops at the Palazzo. Note the adjacent entrance to the bar. 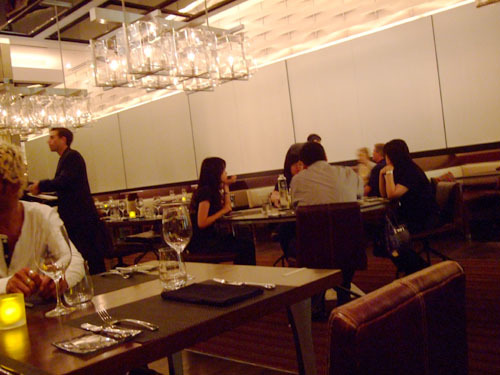 In addition to CUT, Palazzo also houses Carnevino, Mario Batali's steakhouse, and Morels, a French steakhouse. Like its sibling, CUT's interior is sleek and modern, though arguably a bit warmer than the original. Lighting is fairly bright for a steakhouse (as opposed to, let's say, Mastro's), which was a definite plus for my photo taking. The menu is pretty much a carbon copy of the original location's, with a bevy of unique appetizers up front, followed by four grades of steak, other creative entrées, and finally a smattering of sides. Executive Chef Matthew Hurley wasn't in on this particular night, so the menu was signed by Sous Chef Jessica ???. Click for a larger version. 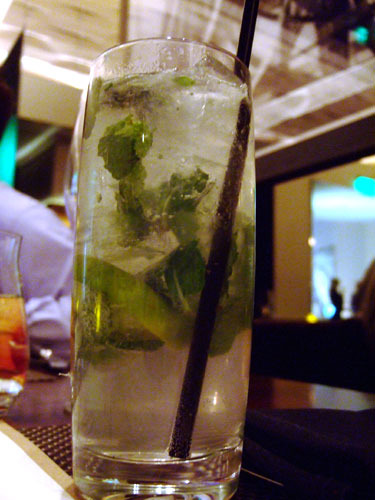 I had my signature mojito to start. It was a solid interpretation of the drink, with everything in balance, no one element dominating. Quite similar to what I had at CUT Beverly Hills actually. 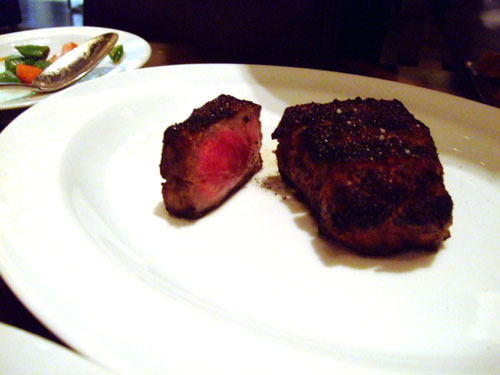 As in Beverly Hills, the selection of meats was brought out to be presented tableside. On the left side, we have an American filet, rib eye, and strip. On the right are the Japanese rib eye and strip. Note the much more intense marbling with the Japanese cuts. 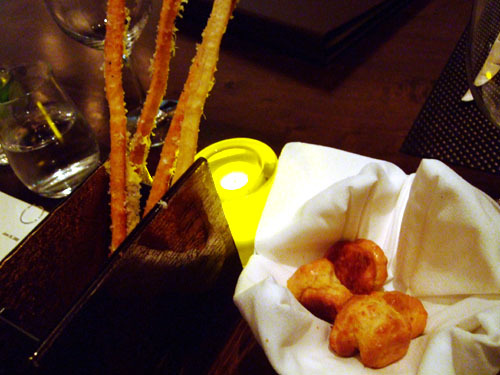 Just like at the original location, the meal started off with a duo of crispy bread sticks and delicious Gruyere cheese Gougères (which also reminded me of versions I've had at French Laundry and Lawry's). 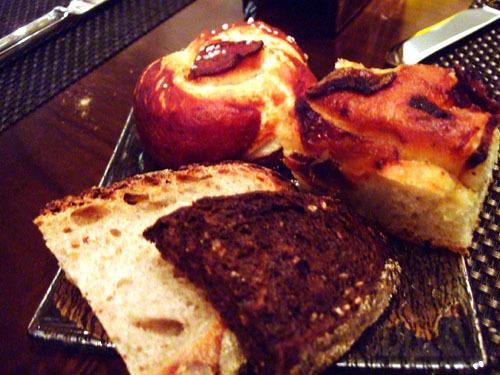 After this came the formal bread selection of pumpernickel, rustic wheat, Bavarian pretzel, and olive focaccia. Arugula, Cherry Tomatoes, French Feta, Goat Yogurt "Tzitzkiki." I'm not a huge fan of salads, but I quite liked this. 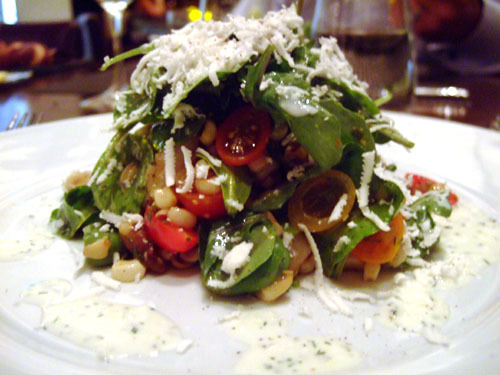 The tomatoes and the corn added a subtle sweetness to the fray, which was nicely tempered by the fava bean and arugula. 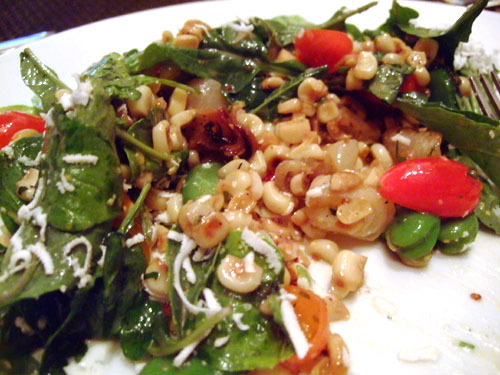 A great harmony of flavors and textures here. 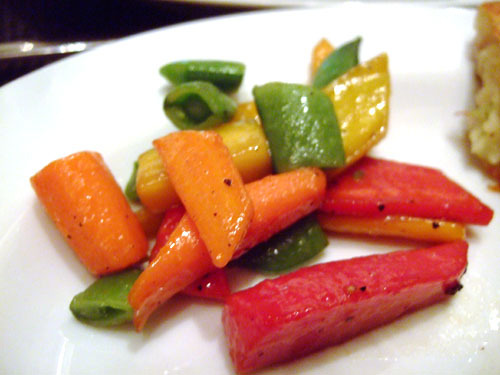 I loved the crispness of the peas, but the veggies had a pronounced sweetness to them due to the honey, which I found rather disconcerting. Traditionally, a tart tatin is an upside down apple tart. 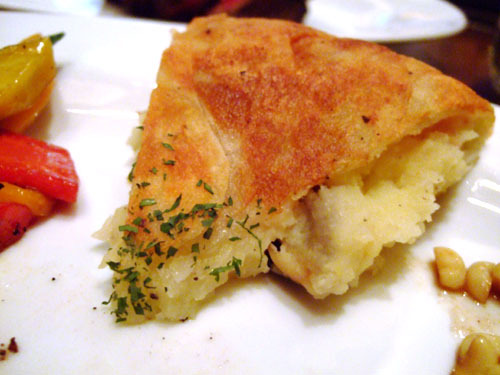 Made with potatoes instead, this version had a delightful, flaky crust encasing a soft, buttery interior. 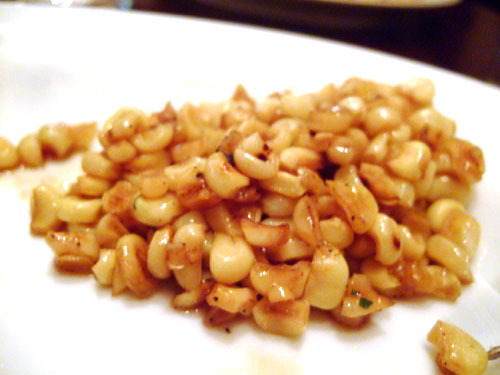 The corn had an ever so slight crunch to it, along with a firmer texture than I'm used to. Pleasant, though nothing special. 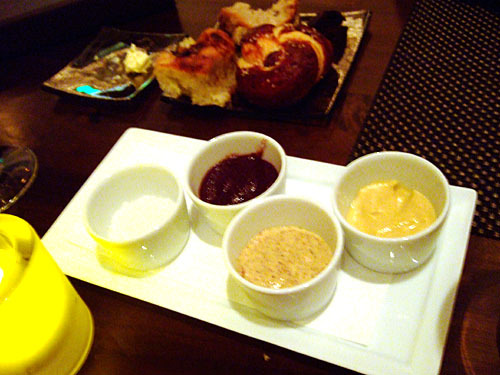 Before the steaks were presented, we were provided a quartet of dipping sauces: fleur de sel, violet mustard, spicy whole grain mustard, and Dijon mustard. Although a kind gesture and perhaps a nice novelty, I found them unnecessary, as the steaks easily stood on their own. Naturally, a steak calls for a stout red wine. 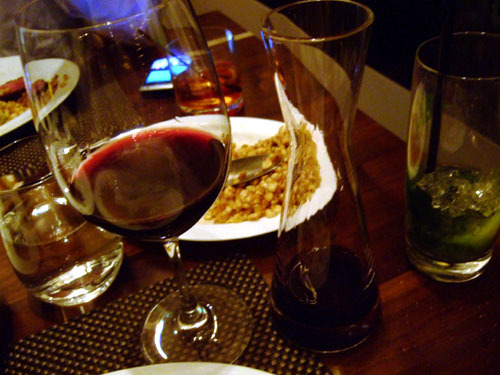 While my dining companions went with Pinot Noir, I paid a visit to South America with the 2006 Achaval-Ferrer Malbec from Mendoza, Argentina. The Malbec was up to the challenge for the most part, showing ripe flavors of dark berry along with hints of minerals and spice. Bone In Filet Mignon 16 Oz. Although this filet was CUT's lowest grade of steak, I still found it superior to any other filet I've had at Fleming's, Mastro's, Morton's, Ruth's Chris, et al. 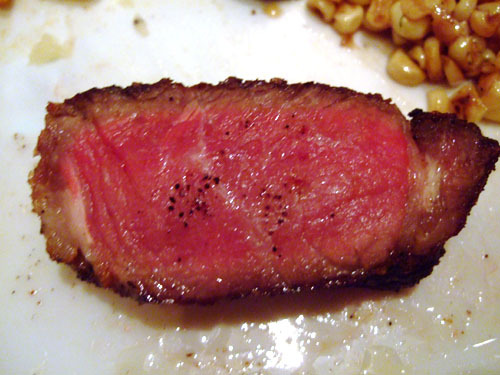 Very tender as expected, but actually quite flavorful for a filet (perhaps due to the bone?). Rib Eye Steak 16 Oz. I'm not normally a fan of rib eyes, but I've really enjoyed the rib eyes I've had a CUT. I'm not sure why, but they just lack the excessive fattiness that most incarnations have. 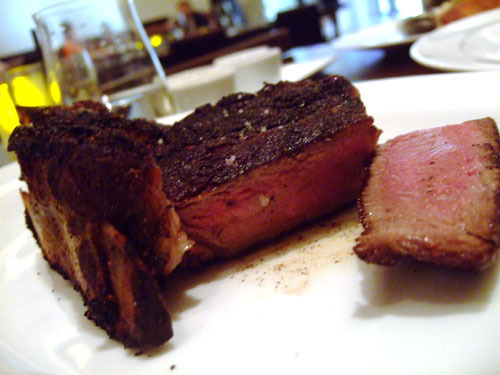 Dry-aging results in a more concentrated beefy taste, and while the rib eye was more flavorful than the filet above, I wonder if it was a result of the dry-aging or simply because rib eyes are naturally more robust. Probably a combination of both. 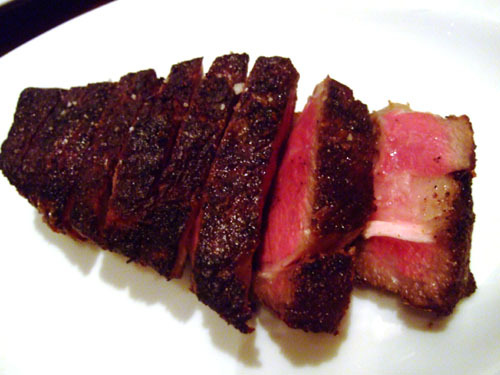 New York Steak 6 Oz. Here's what we were all here for: true Japanese beef. 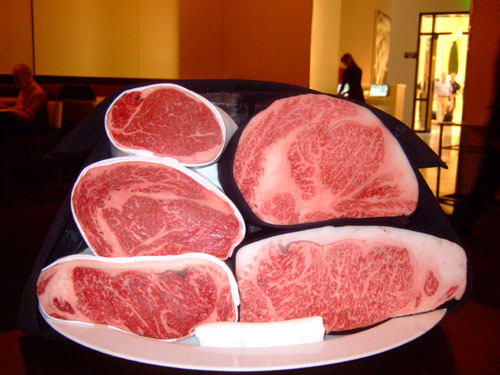 Note the increased marbling compared to the cuts above, and also note how the marbling seems to be more integrated into the meat. 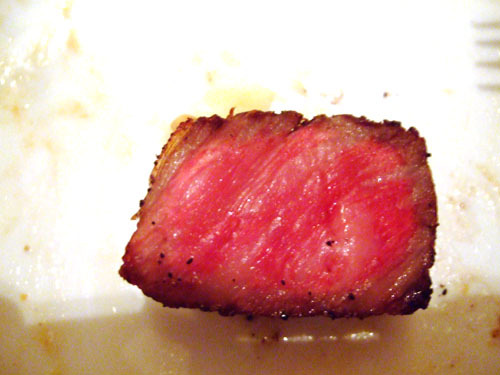 Super tender, melt-in-your-mouth, almost buttery, Kagoshima Wagyu never fails to disappoint. My dining companions, who'd never had real Wagyu before, both thought it was a night-and-day difference compared to your typical beef. 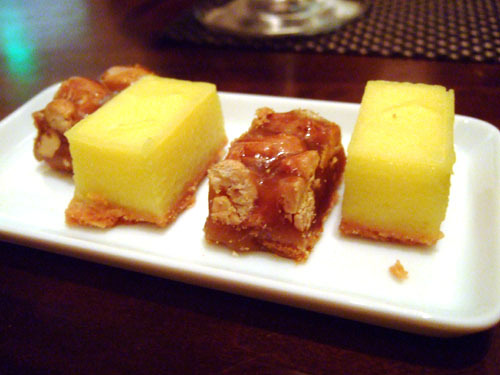 Similar to the Beverly Hills CUT, mignardises consisted of a sticky caramel nut and an overly tart lemon meringue. 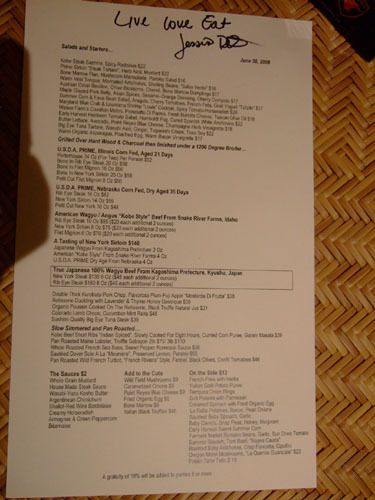 Although this was another positive experience at CUT, it didn't quite achieve the levels of my previous visit. However, I suspect the reason is not the food itself, but rather that my first meal at CUT was a revelation . Ever since that meal, CUT has been the standard bearer of steak for me. This time, I went in with preconceived notions and expectations, and while the food was superb, it just didn't have the same amount of impact. There is really nothing quite like your first time! Do you think the steak tasting on the menu was inspired by us? Us and probably a few other groups who requested the same thing. jesus those steaks look great. i dont know how the other steak houses in the hotel remain open. thanks for another great review. I wonder the same thing. Perhaps they stay open because they're cheaper and less intimidating, or offer a wider variety of accompanying fare? I went to the cut in Vegas, it was so salty. Is that normal for cut because I was so disappointed. I didn't think the steak was too salty when I went (either the LV or BH location), but perhaps we just have different sensitivities to salt? Or, maybe your steak was indeed oversalted. In any case, that shouldn't be the norm. any difference between the bh and vegas cut? anyways, have u been to JG's steak house in vegas? It's been a while since I've visited, but I tended to prefer the original BH location. 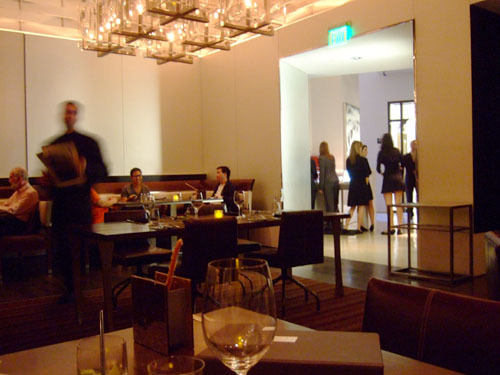 I haven't been to Jean-Georges steakhouse yet, so be sure to let us know how that turns out! Còn 1 câu hỏi mà khá nhiều người hay hỏi order đồng hồ nhật rằng đồng hồ Nhật Bản và đồng hồ Thụy Sỹ thì loại nào tốt hơn ? Chúng tôi xin trả lời rằng mọi sự so sánh đều là khập khiễng vì mỗi thương hiệu đều có những ưu điểm khác nhau. Tuy nhiên ở phân khúc giá dưới 10 triệu đồng thì đồng hồ Thụy Sỹ không thể thắng nổi đồng hồ Nhật Bản và nếu xét về đồng hồ ở phân khúc này thì bạn chọn đồng hồ thương hiệu Nhật Bản sẽ là lựa chọn thông minh nhất.